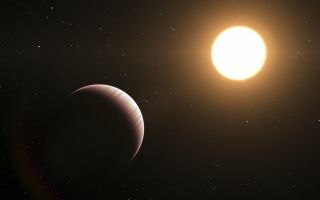 Artist's impression of the alien planet Tau Bootis b, whose atmosphere was probed using a new method. The atmospheres of alien planets can now be probed even if they are not illuminated by stars directly behind them, astronomers say. A new method used to scan the atmosphere of a distant "hot Jupiter" world could eventually reveal insights about many distant alien planets — including, perhaps, whether or not they support life, the researchers added. "If we could detect gases like oxygen, these could point to biological activity," study co-author Ignas Snellen, an astronomer at Leiden University in the Netherlands, told SPACE.com. Scientists have analyzed the atmospheres of exoplanets before, but only when those worlds passed in front of their parent stars, much like Venus did during its recent transit of the sun. Now scientists have for the first time analyzed the atmosphere of an exoplanet that, like most such alien worlds, does not pass between its star and Earth. The planet in question is Tau Boötis b, one of the first exoplanets to be discovered back in 1996 and one of the nearest exoplanets to Earth known, at about 51 light-years away. The world is a "hot Jupiter" — a gas giant orbiting very close to its parent star. The exoplanet's parent star, Tau Boötis, is easily visible with the naked eye, but the planet is not. Up to now, Tau Boötis b was only detectable through its gravitational pull on the star. An international team caught the faint infrared glow from Tau Boötis b using the European Southern Observatory's Very Large Telescope (VLT). "We were able to study the spectrum of the system in much more detail than has been possible before," study lead author Matteo Brogi, of Leiden Observatory in the Netherlands, said in a statement. "Only about 0.01 percent of the light we see comes from the planet, and the rest from the star, so this was not easy." Seeing the planet's light directly also enabled the astronomers to measure the angle of the planet's orbit, helping them deduce its mass — six times that of Jupiter's — accurately for the first time. "The new VLT observations solve the 15-year-old problem of the mass of Tau Boötis b. And the new technique also means that we can now study the atmospheres of exoplanets that don't transit their stars, as well as measuring their masses accurately, which was impossible before," Snellen said. "This is a big step forward." The spectra also yielded details about the temperature of the exoplanet's atmosphere at different altitudes. Surprisingly, they found the planet's atmosphere seems to be cooler higher up, the opposite of what is seen with other hot Jupiters. Earth's atmosphere is cooler at higher altitudes, the closer air gets to the frigid depths of space. Hot Jupiters, on the other hand, typically have atmospheres that are warmer farther up, perhaps due to gases present in their higher layers, such as titanium oxide. Tau Boötis is a star very high in ultraviolet activity, radiation that may destroy these heat-absorbing gases and give Tau Boötis b an atmosphere with temperature features more like Earth's, researchers said. The researchers focused on the spectrum of carbon monoxide, which is expected to be the second-most common gas in the atmospheres of hot Jupiters, after hydrogen. Unlike hydrogen, carbon monoxide has very strong and observable infrared spectral features. Future research can concentrate on other common gases in hot Jupiter atmospheres, such as water vapor and methane. "Our method shows that exoplanet atmospheres can be very well studied using ground-based telescopes," Snellen said. Although Tau Boötis b is much too hot for any life, "possibly in the future we can extend this method to study much cooler planets like the Earth." The scientists detailed their findings in the June 28 issue of the journal Nature.